Ask for help when you need it. Join a caregivers’ support group. Take breaks each day. Spend time with friends. Keep up with your hobbies and interests. Eat healthy foods. Get exercise as often as you can. See your doctor on a regular basis. Keep your health, legal, and financial information up-to-date. Alzheimer’s, or taking the person out for a short time. • Join a support group to share advice and understanding with other caregivers. These groups meet in person or online. 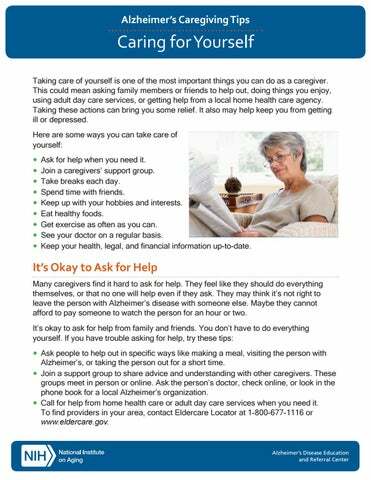 Ask the person’s doctor, check online, or look in the phone book for a local Alzheimer’s organization. • Call for help from home health care or adult day care services when you need it. 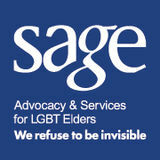 To find providers in your area, contact Eldercare Locator at 1-800-677-1116 or www.eldercare.gov. find out how to pay for some of this help. To learn more about government benefits, see www.nia.nih.gov/ alzheimers/publication/when-youneed-help/getting-help-caregiving. If you are a veteran or caring for one, the U.S. Department of Veterans Affairs (VA) might be of help to you. To learn more, visit the VA caregivers’ website at www.caregiver.va.gov or call toll-free at 1-855-260-3274. I’m doing the best I can. What I’m doing would be hard for anyone. I’m not perfect, but that’s okay. I can’t control some things that happen. Sometimes, I just need to do what works for right now. Even when I do everything I can think of, the person with Alzheimer’s disease will still have problem behaviors because of the illness, not because of what I do. • I will enjoy the moments when we can be together in peace. • I will try to get help from a counselor if caregiving becomes too much for me. Meeting Your Spiritual Needs As the caregiver of a person with Alzheimer’s, you may need more spiritual resources than others do. Meeting your spiritual needs can help you cope better as a caregiver and find a sense of balance and peace. Some people like to be involved with others as part of a faith community, such as a church, temple, or mosque. For others, simply having a sense that larger forces are at work in the world helps meet their spiritual needs. The Alzheimer’s Disease Education and Referral (ADEAR) Center is a service of the National Institute on Aging, part of the National Institutes of Health. The Center offers information and publications for families, caregivers, and professionals about Alzheimer’s disease and age-related cognitive changes.